 Another of Brust's fantasy novels set in the Dragaeran Empire (the Vlad Taltos yarns, etc. 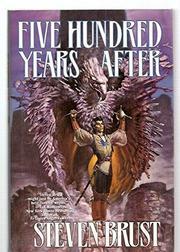 ), this takes place (per the title) 500 years after the events of The Phoenix Guards (1991). Whether imitation, pastiche, or tribute, Brust's swashbucklers are consciously modeled on the Dumas/Sabatini/Errol Flynn school of drama, and they come complete with irritatingly intrusive author, thudding bodies, waving swords, and a modicum of sorcery. The four Empire loyalist heroes of the previous book--Khaavren, Aerich, Tazendra, Pel--again take center stage, required to uncover and frustrate a plot to destroy the Orb of the Empire and thus overthrow the Emperor. While overlong and dense, Brust's yarns have many pleasing features, not least the snappy dialogue and the intriguing and well-thought-out scenario. Overall, more charming than annoying.